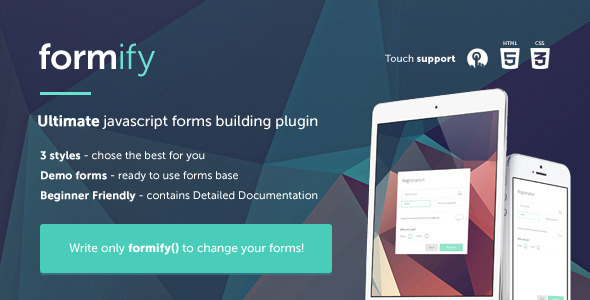 All you have to do is run a script using formify() – the rest will be done automatically. Formify supports mobile devices working on the most popular mobile systems such as iOS, Android or Windows Phone. In addition to the basic activities Formify also has support for touch events such as dragging or moving. Formify in addition to the finished sample forms also has a rich set of ready-made elements and styles, making it easy to create your own form. No inputs templates – You don’t need to copy the templates, the script will do it himself. Easy to customize – With the attached .less files you can easily edit a forms styles.